I’ll try to keep my recap of Comic Con Day 2 short and sweet but there’s so much to cover. Even though I’m pretty sure nothing would have woken me from my deep sleep Friday night, we both felt pretty tired on the shuttle bus heading to the Con. 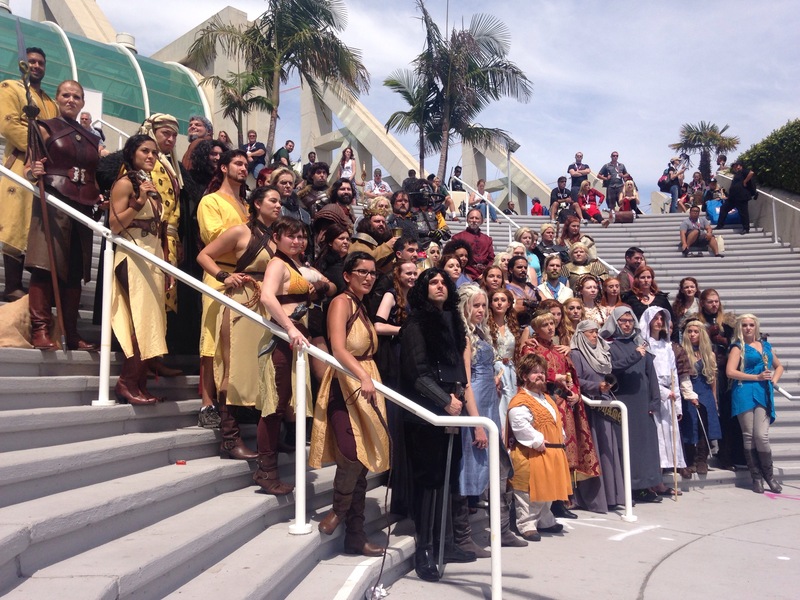 The plan was to hit up some of the events happening outside the actual convention center…the main target was a Game of Thrones Experience, but a friend of mine informed me that they capped the line the previous day at noon and those people were waiting in line until 5PM. Since it was only 9:30 we abandoned the line and went in search of other fun stuff. First we went to the parking lot outside Petco Park and enjoyed the Scream Queens area. Then we hit up Conival hosted by Nerdist which had some fun activities, got to try out some Prattkeeping and do a little laser tag, plus we had free Slurpees since it was 7/11. Be cool raptors….just be cool for once. After grabbing some lunch we tried to go to a Muppets Show panel (which ultimately didn’t happen) but the place we were waiting in line happened to be the location for cosplay photo meet ups, so it was at least an entertaining wait. First up was the DC Universe…for some reason I found it really humorous that all these characters were dancing one second and the next frozen in fighting mode (tried to upload a video but having trouble..here’s a pic instead). Then it was Game of Thrones, super fun! Then it was time for my least favorite part of Comic Con….walking the floor…but it definitely helped me get my steps for the day. Then after a long day we met up with some of my friends in San Diego for some drinks and dinner and then happened upon this outdoor area called the Quartyard which was hosting a Conan O’Brien viewing party…..plus we got some sweet chairs out of it!!! Overall a fun day, with a few surprises….not surprising though is how much my feet hurt.